Motor yacht ERATO is a 27,61m (90' 7") charter boat built by Tecnomarine. 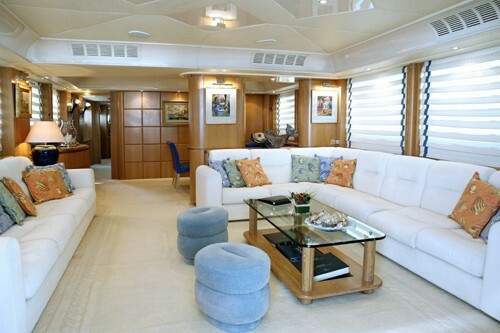 She has a nice shape with sleek lines and is able to accommodate up to 8 guests in four cabins. 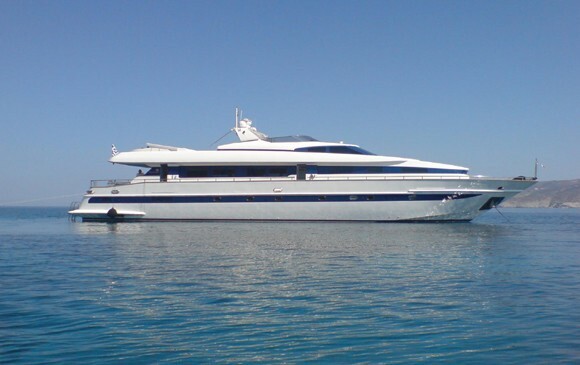 M/Y ERATO is based in Athens, Greece year round and charters throughout the Eastern Mediterranean. 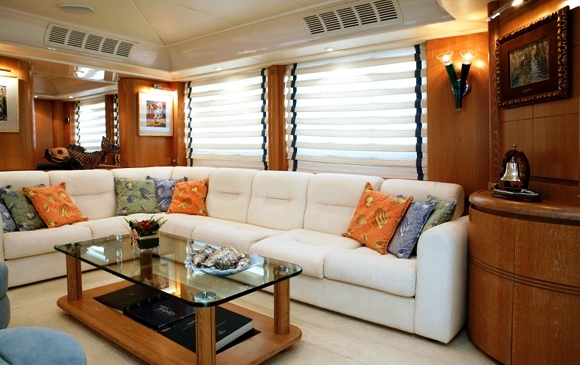 ERATO has a spacious saloon finished in light colours providing a fresh and contemporary feel. 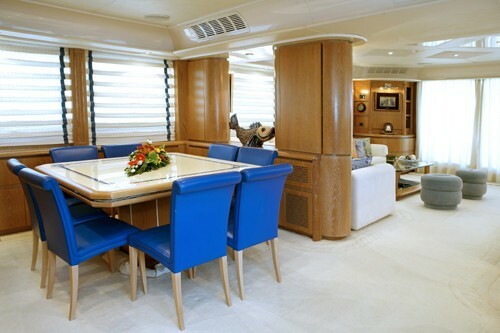 Her dining rooms which is adjacent to the Salon and separated by a partition is decorated with a beautiful enamel table and leather chairs. 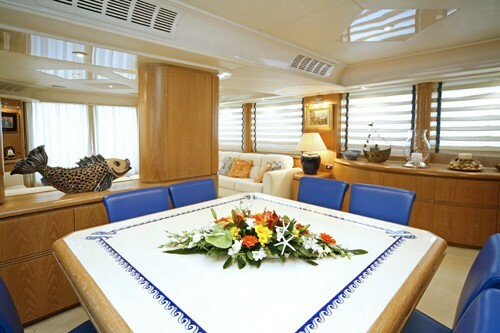 There is additional dining table on the aft deck for dining el fresco meals. The yachts upper sun deck has a cover to shield from the elements that can be removed for open air sun bathing if required. 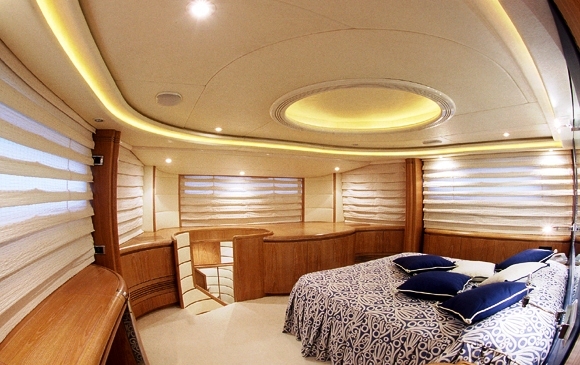 ERATO’s accommodation consist is 4 cabins including a Master cabin located forward on the main deck. 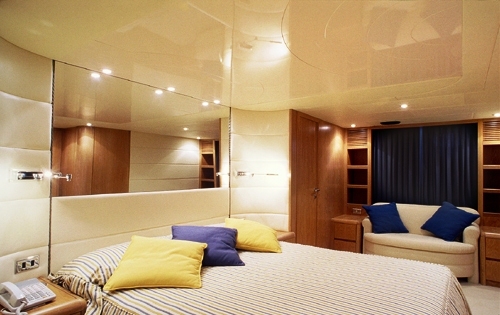 This luxuriously appointed cabin has a king sized bed, TV and CD player, as well as a dressing area and bathroom facilities en suite. 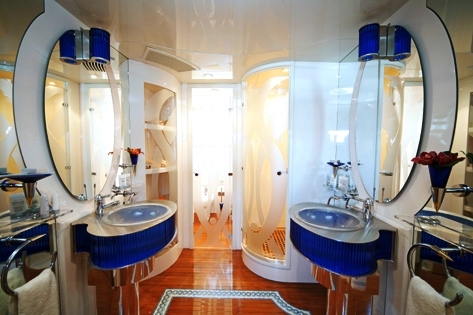 Her VIP cabin features a king sized bed, TV and a CD player as well as bathroom facilities en suite. 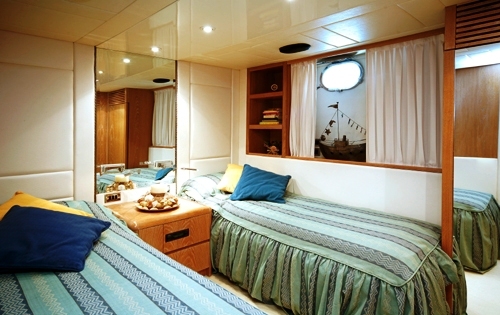 There are also two additional guest cabins, each with twin beds, a CD player and bathroom facilities en suite. 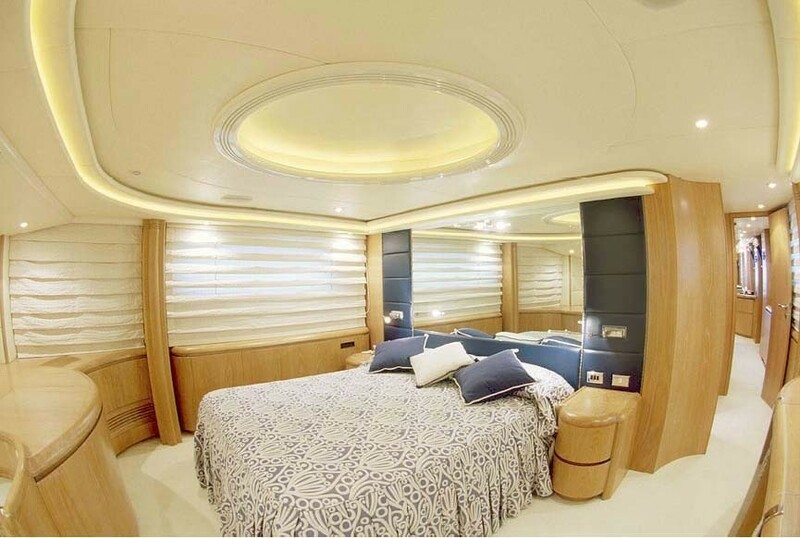 ERATO has a professional crew of 5, who are ready to welcome you onboard for your next East Med charter adventure. 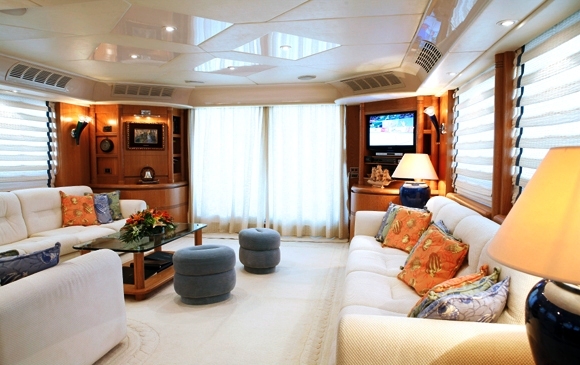 Greece based motor yacht ERATO can accommodate up to 8 guests in 2 double and 2 twin staterooms. 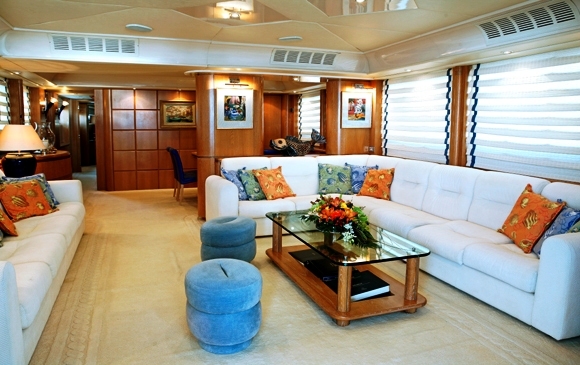 Her master cabin is located on the main deck and has a double bed and ensuite facilities. Below deck she has a VIP cabin with double bed and ensuite facilities and two twin guest cabins with ensuite facilities. 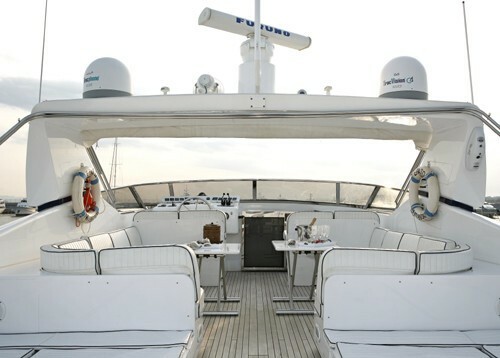 Motor yacht ERATO has a great range of Tenders and Toys including a Novurania RIB tender with 55 HP Yamaha outboard engine, an additional smaller Zodiac inflatable tender equipped with 4 HP Johnson outboard engine, Tubes, Snorkeling equipment and Fishing equipment. 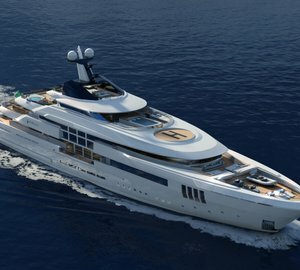 Communications onboard include an Ericsson FCT 251 cellular telephone - fax switch, a Skanti VHF 3000 with repeater on flybridge, a GMDSS VHF, 2 portable VHF units, Captain and GSM mobile telephone. 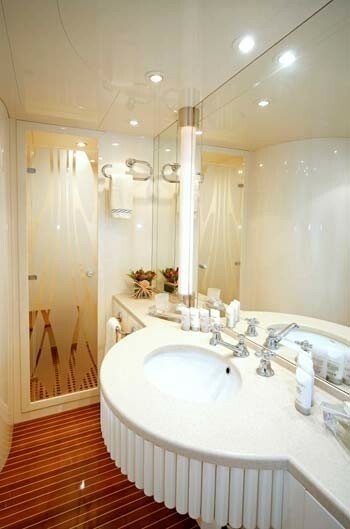 All cabins are served by Panasonic telephone system which provides internal intercom communication and is connected to external land telephone line when yacht moored at home port (Flisvos Marina, Palaio Falero, Athens) and to cellular telephone/fax switch when yacht is cruising. 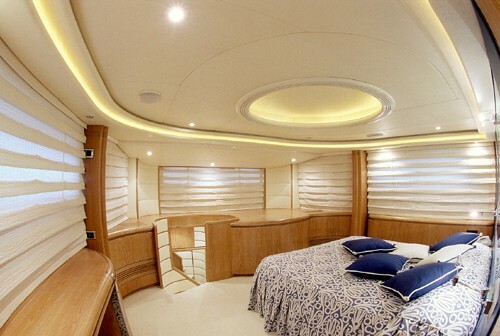 ERATO’s Audio Visual Equipment and Deck Facilities include a KVH TracVision G4 satellite TV system, video ecorder/player, CD multi changer, cassette deck and FM stereo in saloon, a TV in master and VIP cabin and a CD player in all cabins.